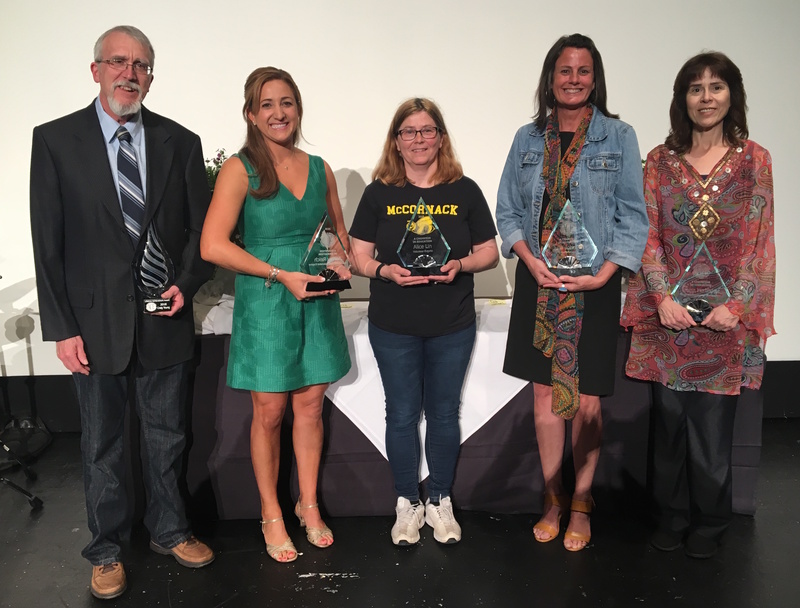 4J staff and volunteers were honored for excellence in education at the 2018 ACE (A Champion in Education) Awards ceremony on Wednesday, May 23. All 117 nominees were recognized and four outstanding educators were named as champions in their category. Each champion will receive a $1,000 award for their school, a generous donation from Oregon Community Credit Union. In addition, one exceptional longtime 4J team member was honored with a special lifetime achievement award. 4J’s 2018 ACE Awards champions are Ashley Reich, Julia Johnson, Teresa Martindale and Alice Lin. The Lifetime Achievement Award was presented to Craig Young. Congratulations to all of our staff and volunteers who were nominated and celebrated at the 2018 ACE Awards. To learn more about each nominee, please see the ACE Awards program that includes a short excerpt from their nomination. Ashley brings so much energy, optimism and encouragement to her school. Her smile can lift up anyone’s day. Between her light-up shoes, custom-saying t-shirts, and outgoing attitude, her positive outlook is instantly contagious. Ashley is an innovator, constantly finding new ways to improve instruction and think outside of the box. She understands that every student is different and needs to be reached in their own way. She spends time every day making sure each student feels successful, encouraged, talented and important. Ashley’s students are successful because they know she is doing her best for them every day and in return, they want to work their best for her. Julia makes a significant difference for the most disenfranchised and vulnerable students and families in our district. She seeks out and re-engages students who are in circumstances that have led school attendance to not be a current priority. She finds them—through our schools, the court system, community organizations, and by walking on the downtown mall—and works with the student, family and school to break down barriers and provide bridges to their education. Julia also works with our middle and high school teams to build a stronger understanding of the needs of our underserved populations and students who struggle connecting with our schools. Teresa is a peacemaker, a good listener and a person of integrity. Her kind, open and supportive manner elicits trust and cooperation. Teresa is held in high regard by students and families with challenging life circumstances. When people are navigating a chaotic life, they need consistency. Teresa has made herself an anchor for those in rough waters. Teresa encourages staff to be continuous learners and to always be improving their craft. She builds on their strengths and leads staff in relevant and useful professional development. Consensus is important to Teresa and she works to find it with all Madison staff. She also is a decisive leader who isn’t afraid to choose her own direction. What doesn’t often get talked about is that when things are at a fevered pitch, Teresa finds the best ways to restore the Madison community. In a job that can seem heavy and serious, Teresa constantly finds the fun. Her levity and willingness to just goof around with kids brings her colleagues back to the simple fact that we all love middle school kids and are grateful to do what we do. Alice works long hours every day to help take care of kids’ academic, social, emotional and physical needs at McCornack Elementary School. She helps in classrooms, working with individual students and small groups. She works behind the scenes organizing the school store and providing food and clothing donations. She strives to serve students better with each gift of her skills, her relatability, her compassion, and her generosity with her time and resources. Most importantly, everything Alice does to contribute to McCornack is done with a huge heart and a student-centered focus. Mr. Craig, as he’s known to students, has been extremely dedicated to River Road/El Camino del Río and the generations of students who have passed through its halls. He has seen students through four decades, from the 1980s to the 2010s. He has worked in and on one of 4J’s oldest school buildings and now the newest. Much has changed and much stays the same. In addition to being dedicated, reliable, and an outstanding model custodian, Craig has a deep understanding of how to build community and has played a major role in the strong sense of togetherness that is enjoyed at the school. Craig is fun, caring, kind, and always willing to help students and staff. He has served as a key positive role model for generations of children. It’s hard for the River Road/Camino del Río community to imagine the school without Craig. He will be greatly missed when he retires after 38 years in 4J. Thanks to all those who took time to nominate a deserving staff member or volunteer, or attended the event to celebrate excellence in education. Thanks to Oregon Community Credit Union for continued generosity in support of our public schools and outstanding educators. Last but not least, thank you to all of our 4J staff and volunteers who make a difference in the lives of children every day.